The Bhrigu Lake trek is a popular trek in Himachal Pradesh which lies in the heart of Kullu Valley. The maximum altitude during this trek is 4267 metres/14000 feet. This trek is through the high-altitude alpine meadows and woody trails tucked away in the mountains of Kullu Valley. The view around the Bhrigu Lake is charming and spectacular with the lake changing colours all through the day. The Bhrigu Lake has a mythical significance attached to it. As per legend, the great Bhrigu Maharishi had meditated at this lake, many hundred years ago; the lake is located about 6km from the picturesque Gulaba. The weather in summers varies from 20–25 degrees during day time and 5–7 degrees at night. During winter, the temperatures are 10-15 degrees at daytime and -7 degrees at night. The trek not only offers superlative views of the Himalayan ranges, trekking up the highest Himalayan lush green meadows and rolling mountain slopes, but the route takes you through colourful villages, welcoming warm people, and their quaint lifestyle. The Bhrigu Lake trek is rated as 'Easy' and is suitable for beginners. Two hour drive to Gulaba Village and a trek of 3-4 hours covering 7 kms. The trek begins in Manali with a drive to Gulaba Village, about 22 km from Manali. The first destination from Gulaba Village is the Gulaba campsite, which is about 3 km from the village and takes a trek of one hour to reach. The trek goes through a dense woody trail. Further, after a steady and steep climb of 20 minutes through rivulets, the team reach the vast, green meadows. This place offers astounding views of the Hanuman Tibba and other mountain ranges. You trek from Gulaba camp to Rola Kholi passing through the Kolang Nallah. This place presents great views of Solang, Manali, and the seven sister peaks. The campsite here is surrounded by mountains all around, shielding the place from blustery winds. The team camps overnight at this place. 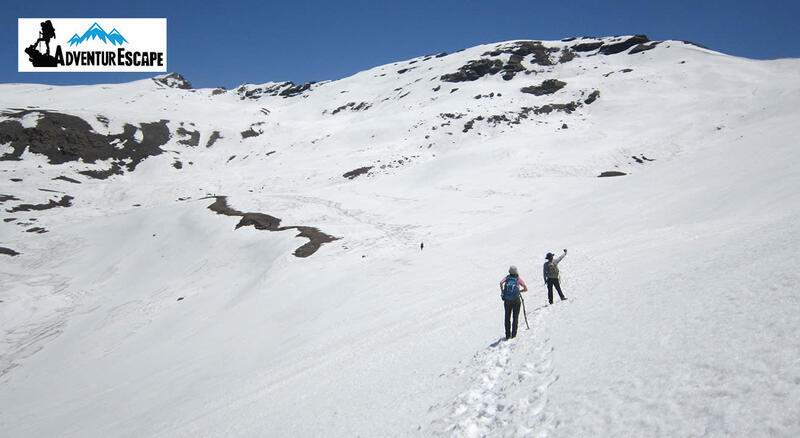 The trek to Bhrigu Lake from Rola Kohli is a steep ascent. The sight of this magnificent lake, even from a distance is captivating. The lake remains frozen for the most part of the year barring the summer months. The crystals of water glistening through the golden rays of the sun offer colourful hues during different times of the day. Alpine blossoms amidst the grassy green pastures are a sight to behold. After a stop at the Bhrigu Lake, the trek makes a steady descent to Pandu Ropa. The trek is through green rice fields and beautiful meadows. The team camps out at Pandu Ropa where there will be bonfire and dinner. The 8 km trek takes 4 hours + drive to Manali. Today, you trek to Vashishth from Pandu Ropa, which is one amidst awesome views. Vashishth is a place engulfed with hot water springs. The temple shrines of Lord Rama and Vashishth Maharishi are popular here. The team reaches Vashishth where they officially end the trek and proceed on their return journey to Manali. Accommodation costs for triple sharing stay in camps cost of sleeping bags, with roll-on mattresses and the pantry/kitchen and toilet facilities. Qualified and experienced guides and support staff. The cost of meals provided all through the trek. All costs of helpers, porters, and the mule costs used for transporting equipment all through the trek. Transport from Manali and back. Any other cost of other equipment other than those that are listed above in the inclusions should be entirely borne by the trekkers. Cost of porters / Mules for personal baggage. Trekking shoes: Trekking shoes with good grip and ankle support is compulsory for the trek. Please ensure that the trekking shoes are not new and used by the trekker prior to the trek. The trail is slippery and requires you to walk through rocks and boulders, so a good grip and water resistant shoe is necessary. Do keep an extra floater in case of rain and for use in camps. Cutlery: Carry a spoon, mug and a lunch box. Adventure Escape insist on trekkers getting their own cutlery for hygiene reasons and for packed lunch. Warm jacket and sweater (couple of them if you feel more susceptible to cold). Collared shirts (3-4), full sleeves, and quick dry so that it prevents sunburn on the arms and neck area. Poncho: Poncho is very important when you are trekking in the monsoon season to protect you from the rain. You can rent one from Adventure Escape at INR 50 per day. Socks (2 pairs) + woollen socks (2 pairs) for keeping you warm in the camps. The nearest airport for Manali is Bhuntar, 50 km (approx) from Manali. Air India & Air Himalayas (9-seater, non-scheduled flights) have flights for Kullu. Air India has flights to Kullu from Delhi Airport & Air Himalayas operates flights from Chandigarh Airport. The two nearest railway stations for Manali are at Chandigarh (350 km) and Ambala (360 km). Onward journey can be travelled either by chartered taxis, buses or by air, as Himalayan Bulls, a private 8-seater charter is available between Chandigarh & Kullu. You can also reach Manali by road. There are many Volvo buses running from Delhi and Chandigarh daily. Delhi to Manali buses is available from RK Ashram Marg as well as ISBT Kashmiri Gate. Chandigarh to Manali buses are available from Sector 43 Bus Stand. What is the style of accommodation in this trek? Brighu Lake is a 4 day trek. Accommodation will be in tents on all the days – each tent will be shared by 3 trekkers. The tents will be provided by AdventurEscape. They will also put up toilet tents – the number will vary according to the size of the group. Yes. AdventurEscape will provide each trekker with a sleeping bag. The sleeping bags provided can withstand temperatures up to -10° C on high altitude treks. June to September are the best months for the Bhrigu Lake trek. What will the temperatures be like June, July and September? Bhrigu Lake is at an altitude of 14,009 ft. At altitudes as high as these, temperatures go up to 18°C during the day and might fall to -1 to -2°C in the night. You are likely to find snow on this trek in June. However, this depends on the amount of snowfall that happens in the preceding winter. If it starts raining while you’re trekking, the group will continue on the trail as planned. Your poncho should protect you from the rains. Carry a backpack cover for extra protection from rains for your belongings. When it rains at the campsite, the group usually gets together in the dining tent and plays games. The tents that you will be staying in, the dining tent, kitchen and toilet tents are all water proof, so you will stay dry inside.